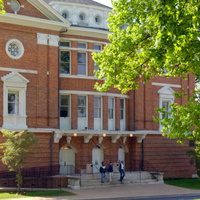 Historic building, main auditorium with box office (smaller theater setting on lower floor), W. Main St. entrance opposite Carroll Hall. Keynote Lectures as part of Traditions Weeks for Common Ground on the Hill. Lovely production, good acting, economic set and stage design, well rehearsed and controlled performance to create a polished play that resounded strongly in the hearts of it's audience.